8min/mi – 9min/mi, depending on my goal for that particular marathon. 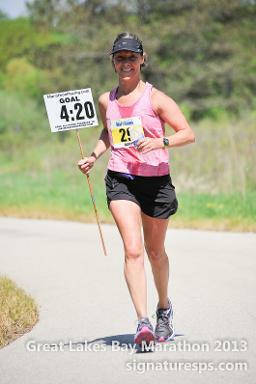 Typically I pace the 4:10 – 4:20 groups. I never run with music. I usually have very good company with me. I’m in an Information Specialist for University of Michigan’s library system. All food is favorite food. I don’t show a preference towards one group over another. On the side, I swim and bike. But I’m not interested in taking that a different level. I train mostly with my running club, about 10 of us, including 2 dogs. Right now I’m reading lots and lots of science books. But my favorite books include real life adventure stories and Victorian literature. Currently I’m working on a BS (2nd degree) in Biology with a Chemistry minor. And I’d also like to become fluent in Spanish. I run for the entertainment value! My best run marathon is probably my most memorable marathon. 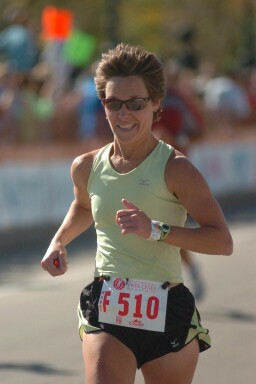 Boston ’06 – The weather was marathon perfect; I was completely relaxed and healthy with no real strategy in mind. This brought about a cool 3:26:47. Pacing is a very rewarding experience for me. I really get a thrill out of seeing those in my group cross the finish line. Plus I too get a medal for my effort! Every pacing experience is a “best” pacing experience, especially when runners feel happy and healthy at the end of the race. The group offers companionship, which is a great way to get through some dark miles of the marathon. Runners tend not feel so isolated if they are part of a group attempting the same goal. Please be relaxed, ready to run a healthy marathon in a smart fashion, and simply be prepared to have fun! And make sure you look great for our group photo ops on the course!